We spent last Christmas Day with our daughter, her partner and our granddaughter, Milly, and pride of place was taken by the Christmas tree, which Milly proudly helped to decorate. After Christmas, the tree was planted in the garden at my daughter's house, where we hope it will thrive until next Christmas. To help the tree settle into its garden site, Milly likes to regularly water it to make sure it doesn't dry out. As I accompanied Milly on one of these watering sessions, I took a closer look at the area where the tree has been planted and to my surprise I found two different fungi growing in considerable profusion nearby. I can't believe that, without my noticing, these fungi have been quietly growing so close to places I visit so regularly. I suppose the lesson here is that I need to be more observant and appreciative of what is around me! 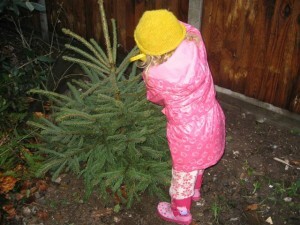 This is Milly watering her Christmas tree. 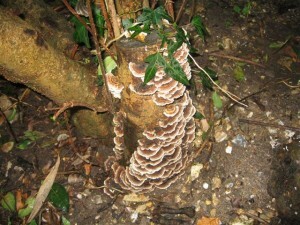 Some unexpected fungi growing near Milly's tree. 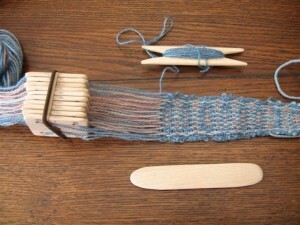 I hope the photos below will show that I am making some progress with my tablet weaving. The yarns I am using are all wool and dyed in woad. 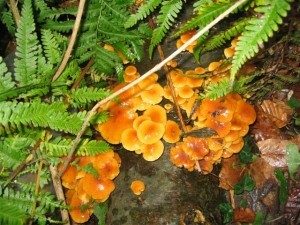 The tan colour was achieved from the same leaves previously used to make the blue woad vat. I saved the squeezed-out leaves and then simmered them for about 30 minutes to extract the tan dye. Then I strained off the dye liquid, added the unmordanted wool and simmered gently for about half an hour. I have been using Candace Crockett's book "Card Weaving" as my instruction manual and, apart from one or two sections at the beginning where the illustrations and the written instructions don't seem to "match" completely, I have found this book generally very clearly laid out and the instructions easy to follow. I suspect that any problems I may have had initially were probably because my experience of weaving is so limited and nothing could be taken for granted. Although there is obviously much room for improvement. 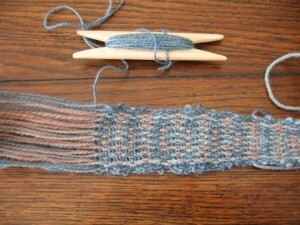 especially in achieving straight edges, I must say that I am surprised at how much I am enjoying this weaving process, especially watching the pattern develop.